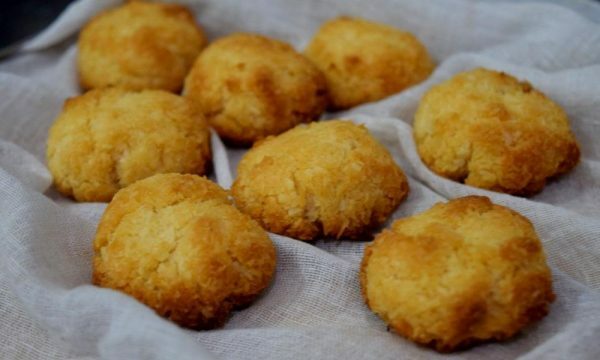 Coconut Macaroons are small cookies made from coconut. The name of these cookies came from the Italian word “Maccarone” which means paste. Typically these are made with egg white and almond flour. But with time almond flour got replaced with coconut and/or other nuts. As much as these coconut macaroons are delicious, there is an interesting story too behind these cookies. The traces of Macaroons are dated back to the 9th century in an Italian monastery. In 1533, the monks came to France and joined a pastry chef. Sooner Sister Marguerite and Sister Marie-Elisabeth joined the monks in France. They started baking Macaroons to earn their livelihood. Later, they became famous as the “Macaroon sisters”. Italian Jews adopted these Macaroons because of the absence of leavening agent and flour. They could eat these Coconut Macaroons during the eight-day observation of Passover. To make these coconut macaroons all we need 3 ingredients: Coconut, condensed milk, and essence for flavor. Yes, you read it right, 3 ingredients are all you need. 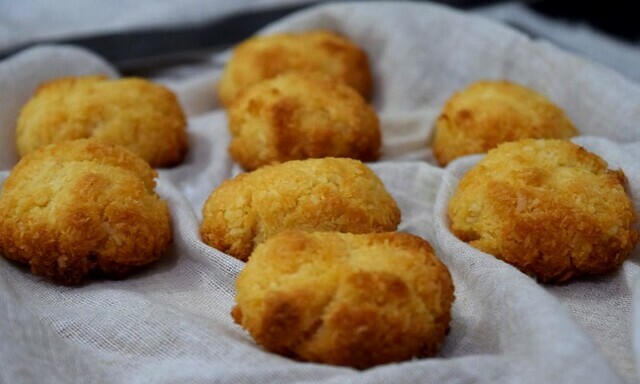 Easy to make and divine to eat these eggless coconut macaroons are truly amazing. I have used Roasted sweet almond flavor from Fab Flavours to give that authentic flavor to coconut macaroons. These cookies do not need Baking powder or Baking soda. These have no butter, no oil. These cookies do not need any prior preparations. These are so easy to make that even kids in the family can also bake these. Keep the oven for preheating at 180 °C. Line a baking tray with parchment paper. In a mixing bowl, add coconut, condensed milk, and almond essence. For this recipe, I have used Homemade condensed milk that was without refined sugar. But you can use regular market one. 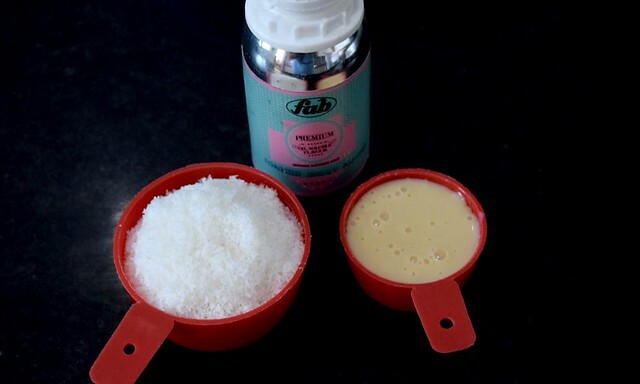 Mix everything until condensed milk and coconut are completely mixed. The mixture will be little sticky but not wet. Note: Do not add milk or any other liquid. Divide the mixture into 9 equal portions. Gently shape them into a rounded mound to form classic macaroon shape. Place them on a baking tray by leaving some space in-between. Bake in the preheated oven at 180 °C for 15 minutes or until the tops are golden brown. 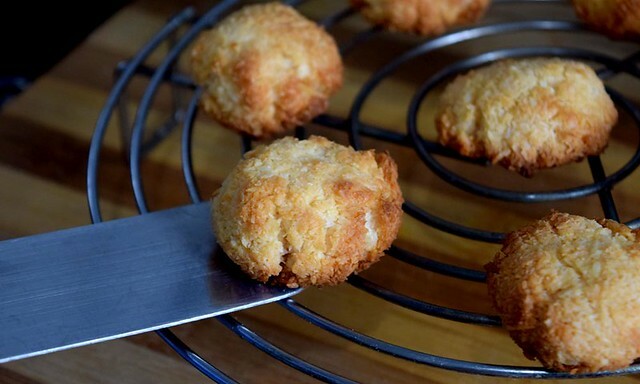 When baked, remove from the oven and transfer baked coconut macaroons on a cooling rack. Allow them to cool. Personally, I like to have these coconut macaroons while they are still warm, I like their chewy texture. Our eggless coconut macaroons are ready to delight everyone. Store them in an airtight container. These stay good for 7 days. These Coconut Macaroons are Eggless, Flourless, No Butter, and No oil. These delicious and flavorful coconut macaroons are made only with coconut, condensed milk, and essence. A simple and step-by-step recipe for you to bake and delight your friends with these special coconut macaroons. Keep the oven for preheating at 180 °C. In a mixing bowl, add coconut, condensed milk, and Almond essence. Mix everything. Divide the mixture into 9 equal portions. Gently shape them into rounded mound. Place them on baking tray by leaving some space in-between. Bake in the preheated oven at 180 °C for 15 minutes. 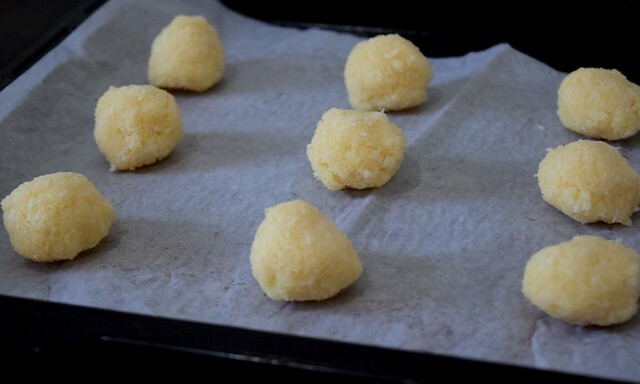 When baked, remove the coconut macaroons from the oven and transfer them to a cooling rack. Do not add any additional liquid like milk or oil. Don’t add Baking powder or baking soda as it is not required. This recipe is safe and perfect for people who are allergic to gluten. If you want to increase the sweetness, you can add 1 tbs of sugar. Can we use vanilla essence instead Almond essence? Yes you can use vanilla essence or you can skip adding any essence. It will work both the ways. Hi Sonia ,is it ok to use vanilla essence instead of almond essence as we doesn’t like the taste of it? Yes, you can replace almond essence with vanilla essence. 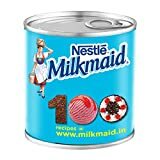 Does the condensed milk need to be at Tim temperature for this or chilled? Tried these and came out quick and lovely. Only one point though, the flavoring essence needs to be added depending on the brand. I used Ossoro’s and it was just too strong, almost like detergent when i used 1/4 tsp. Maybe you can update the recipe to say that flavoring essence can be as per the brand and taste of the person baking it. I tried the next batch without essence and it was just yummy. Thanks for your feedback. It is a nice suggestion and I will make the necessary changes. Will the cookies be crispy once cooled? 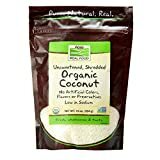 Is Shredded coconut same as dessicated coconut? The outer is crispy and inside is chewy in these cookies. yes, shredded coconut is same as desiccated coconut. Hello mam can I use fresh coconut instead of dry coconut?? 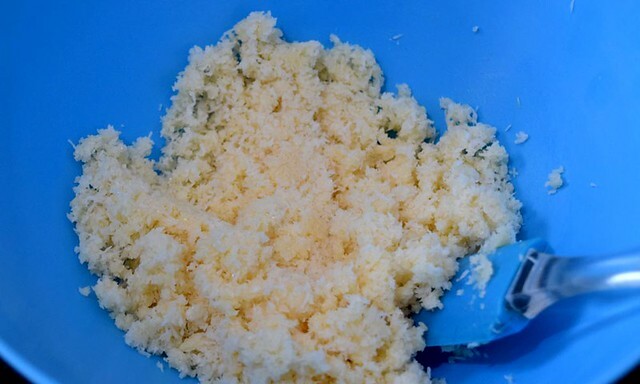 Fresh coconut has more moisture that can impact the texture of dough as well as cookies. As a result your cookies will be soft and moist ( not crispy). Hi, can we fry fresh coconut to make it dry and use?? 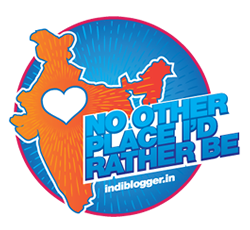 Annapurna, you can sun dry it or dry roast coconut. 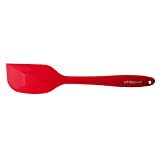 We have used Fab Flavors Almond Essence, however that is not available online. As an alternative, you can use the following Almond Essence. You cannot bake in just microwave mode.